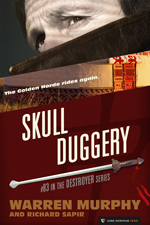 A defector knows where the treasure of Genghis Khan is, but the Chinese are hot on his trail. Chiun enlists the ever-ready Mongols to back him up, while Remo has a horde of his own. Remo must use all his skill against drugs, a 250 year-old enemy of Sinanju, the Chinese army and—could it be?—Bruce Lee.